I am on record as being one who advocated for the forgiveness of the multi-talented, multi-platinum Chris Brown as far back as February 2009, when the most media and much of the public wanted to banish and boycott him forever. His missteps with the media in the aftermath turned the fury way up, as he looked far from remorseful—especially in contrast to Rihanna’s composed, deliberate testimony on 20/20. I understand the fury; I was furious about his assault of Rihanna on Grammy Night 2009 too. But this rigid, visceral approach to such a layered issue is neither humane nor realistic. Endless castigation does not break the cycle of relationship violence. If we want young men, especially young men of color, to stop abusing women, we must condemn the behavior, and support the full rehabilitation of the person. Ron Artest has shown us that therapy can help anyone rise to become a champion in work and in life. Chris must seek help from psychological professionals, spiritual counselors, and anger management experts. Chris is going to be atoning and reconciling for years to come. That process is well underway. The part we as consumers, fans, and members of the media can support him with is the revitalization of his career. Chris Brown is a gifted young performer who deserves to make a living at what he is passionate about. 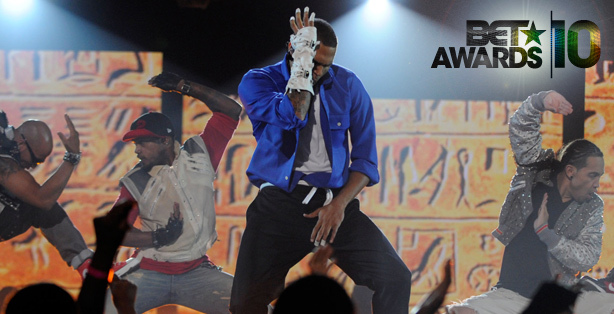 BET provided Chris Brown with the opportunity of a lifetime on the 2010 BET Awards: to pay homage to his mentor Michael Jackson with a powerful medley of the King of Pop’s hit songs and signature dance routines. True to form, the media looked for the worst from a heartfelt and otherwise technically flawless performance–until the part where Chris broke down emotionally in an effort to sing “Man In The Mirror”. His sincerity was questioned. His tears, snot and hoarse voice were called ‘staged’. Just another signal that the path of least resistance, further vilification of the young Black male, was being tread yet again. A brother can’t even emote! But the audience on their feet at the Shrine and millions on couches across America knew that what he was feeling was very real: the overwhelm of Michael passing and finally being able to commemorate his idol’s life; the passage of the hardest of his own 21 years; the energy of the room singing when he could not, crying with him, releasing with him. This is what it means to be human. This collective catharsis was an important step in the healing process for everyone who empathizes with Chris and wishes him well. It’s exactly why that moment was the one everyone was talking about the morning after and well into this week. The crime will not be forgotten, but the man needs to be forgiven. We say we want him to take a look at himself and make a change; change is hard. Let him do it. I’ve re-posted my essence.com commentary for reference. I look forward to your comments. This past February, Chris Brown shocked the world. In the wee morning hours of the Grammy Awards, he brutally assaulted his then-girlfriend Rihanna. On June 22, 2009, Chris Brown pled guilty. The judge handed him his sentence, convicting Brown of felony assault, mandating him to keep his distance from Rihanna (50 yards for five years), and to serve 5 years of probation including 180 days of community labor. Brown was also ordered to enroll in a domestic violence counseling program. Brown’s face registered remorse and relief that day in court; looked like it dawned on him how close he came to prison time. But was he truly sorry? Was his gesture too little too late? Not only for his victim, Rihanna, but for his fans and critics? I conducted an informal poll on Facebook and Twitter. While the media was castigating him, I blogged back in February (click hyperlinked Feruary 2009 above) that the public was too quick to dismiss him and predict his career’s end. That compassionate condemnation was in order, not excommunication. Sure, the execution could have been tighter, but I challenge anyone to recall an apology that felt smooth as silk following an egregious action. Taking a slice of humble pie and expressing remorse is usually awkward and delayed, requiring time. Reconciliation takes patience and work and Brown has taken his first step. Some might argue that Brown’s timing is off, but I believe an apology has no expiration date. Brown deserves forgiveness. What if Chris Brown was your son, nephew or brother? Assuming a zero-tolerance policy on abuse is fine, but judging someone unfairly and withholding support can interfere or jeopardize the healing process and ultimately redemption. We can stand against violence by looking its perpetrators in the eye and demand that they be and do better, but remember, it’s never too late to choose forgiveness over judgment. This entry was posted on June 29, 2010 at 7:06 pm and is filed under Entertainment. You can follow any responses to this entry through the RSS 2.0 feed. You can leave a response, or trackback from your own site. I agree. He seemed sincere to me on the BET Awards. I’m one for second changes if the person truly has remorse. I didn’t feel he had remorse until I saw his BET Awards performance. We have to forgive. Billy I never thought about the idea that people could finally get a sense of the regret he might feel from that performance…thanks for your comment! Let the healing continue! Lay to namebrandlow.com to retinue all your needs after considerable value items. Where you can retail all items for a higher profit. Fine blog. Can I know very well what theme did you work with? Very first thing , A big thanks to you to open my eyes….